Are you ready to open up your inground pool by yourself this year? Have no fear, it’s easier than you think. You SHOULD open up your own swimming pool. It will save you time and money, because you won’t have to hire someone to do it for you…unless you want to. Here is a very basic set of instructions. If you follow these 10 steps to open your pool, you’ll be thanking the gods you didn’t pay anyone, and you’ll be swimming sooner! Remove all water, leaves, and debris from your cover. 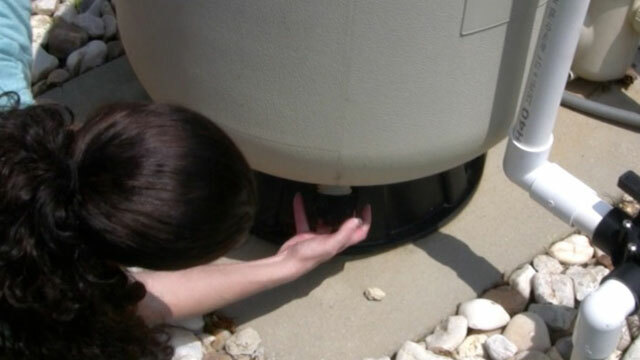 To remove the water, you can use a submersible pool cover pump. Removing the debris can be tricky. Once the water is off the cover, you can use a broom to sweep off any large piles of debris. DO NOT use anything sharp or harsh on your cover. SMART TIP: Once the water is removed, you could wait a day or two for the cover to dry and blow the debris off with a leaf blower. 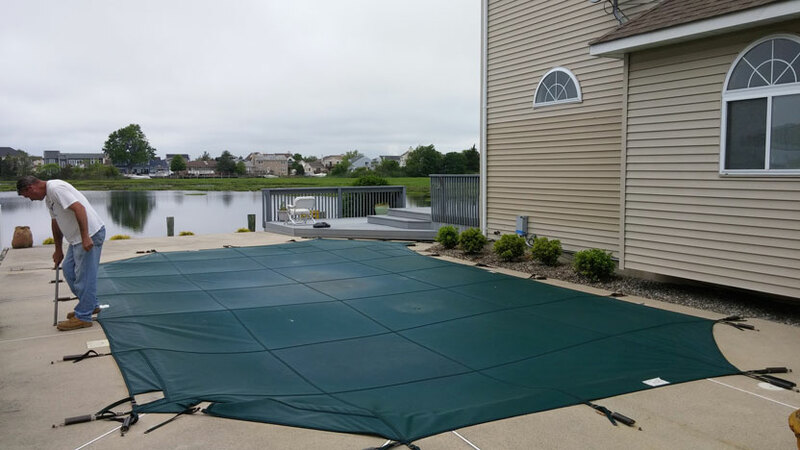 Carefully remove the cover without getting any debris, that remains on the top of the cover, into the pool. If dirty water and debris get fall in the water, it’s not a big deal. You will just have to remove it from the water later. Lay the cover out on your lawn or a nearby area. Use water, soap, and a soft brush to wash your cover. You can use a winter cover cleaner, and some cover cleaners will even allow you to store the cover wet. SMART TIP: Invest in a heavy duty plastic container with a lid to store your cover away. This will prevent bugs and rodents from eating or making a nest in your cover. This will extend the life of your pool cover. NOTE: If you’re using water tubes to secure your pool cover, make sure you empty and dry them out before storing. Walk around your pool and make sure all winter plugs are removed from any openings in your pool, including return jets and step jets. Replace your return lines with the proper eyeball or jet fittings. NOTE: If bubbles rise from the return or step jets when you remove the plugs, this is a sign that the lines (pipes) were properly blown out during winterization (pool closing). Next, remove the ice compensator(s) from your skimmer bucket(s) and remove the winter plugs from the bottom. Then, replace the skimmer baskets. Make sure you lubricate all bolts to prevent rusting throughout the summer months. 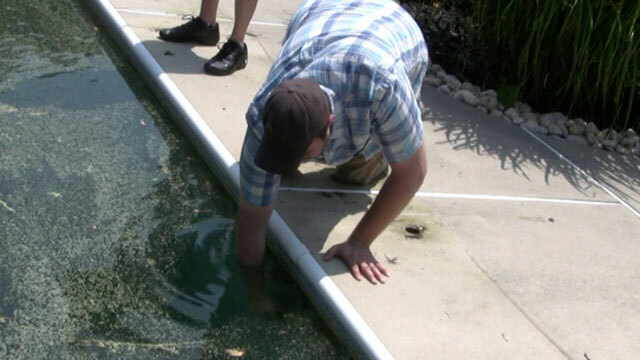 Your pool might have been drained during winterization or lost water over the winter. If the water level in your pool is below the midway point of the skimmer opening, use your garden hose to fill it up. Replace the drain plugs and other parts, including your pressure gauge, on your filter and pump. Your filter should have one major drain plug and your pump may have one or two. If you have a multiport valve, make sure you replace the air bleeder, sight glass, and pressure gauge. SMART TIP: Check the lid o-ring on your pump housing. Bend it with your fingers all around to check for any cracks in the rubber. A dry, cracked o-ring will cause your filter to pull air, which is not good. If this is the case, you should replace it. If the o-ring looks good, I suggest applying a Teflon-based o-ring lubricant to create a good seal and making it easy to remove the pump lid when needed. Re-install any additional equipment, including a booster pump, heater or chlorine dispenser, and make sure all drain plugs are securely in place. Turn on the power to your pump and filter. Make sure the system starts up properly. Check for any leaks or drips. If your pump isn’t pulling any water, you’ll need to help prime the pump. Shut off your filter system, remove the pump lid, and fill the housing with water. You can use a garden hose or a bucket of water from your pool. Replace the lid and turn your filter back on. This should help get the pump to pull water in from the skimmer(s) and main drain(s). NOTE: If the pressure on your filter tank seems high (over 15 psi), it might be a good idea to backwash your sand filter. After backwashing a D.E. (diatomaceous earth) filter, add fresh D.E. powder according to the manufacturer’s instructions. Using a plastic leaf net (preferably with a rubber lining) attached to your telescopic pole, remove any debris that’s in your water. If there’s a large amount of debris on the bottom of your pool, carefully scoop it up with the leaf net. Try to remove as much debris from the water as possible. Attach a pool brush to your telescopic pole and brush the walls and floor of the pool. This will help get the dirt into suspension and allow your filter to remove it. SMART TIP: Make sure you turn your valves to pull water in from your bottom drain(s). This will help the filter collect the dirt and debris on the floor of your pool. Take a sample of your water to a local pool supply store to get it professionally analyzed. You want to make sure you pH and alkalinity are properly balanced before adding any other pool chemicals. Once your pool water is balanced, add the proper amount of sanitizer to your water (i.e. chlorine, bromine, or Baquacil). I recommend double shocking your pool using 2 lbs. (or bags) of shock for every 10,000 gallons of water, or 5 gallons of liquid chlorine per 20,000 gallons of water. Let your pool run at least 24 hours and vacuum out any debris using your manual vacuum. Retest the water using a home test kit or test strips. If everything checks out, and the pool is clear or cloudy blue, it’s ready to swim in!